The day started fine and remained so until well after we had packed up. 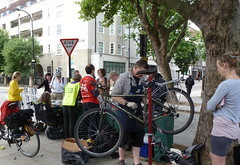 We are grateful to Camden Council for their support of this event and in particular to Paul Davis who brought along the tables and a good supply of maps in the electric van; and to Richard Riddle who worked tirelessly as one of our three Dr. Bikes. 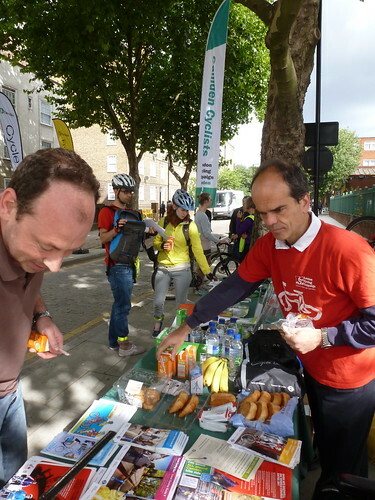 Stefano Casalotti did the shopping – arriving at 7.30 am with a trailer full of croissants, buns, bananas and cartons of juice, which were welcomed by passing cyclists. 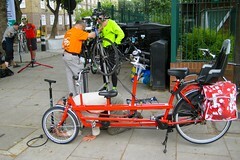 John Chamberlain brought his trailer with our information for cyclists and his Dr Bike stand and tools. 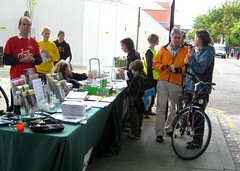 Helen Vecht and Susan Seymour looked after the stall and with Jean Dollimore, greeted the passing cyclists. 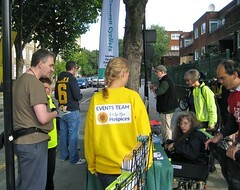 Katy Sprake from Help the Hospices helped enthusiastically with telling people both about Camden Cyclists & LCC and promoting HtH rides to Brighton, Amsterdam and Paris. It was good to see both new cyclists and the familiar faces of many others who have been been active with Camden Cyclists over the years. People started to arrive well before 8 am and although many were in too much of a hurry to stop, we had about 250 visitors. We still need the count of bikes serviced. 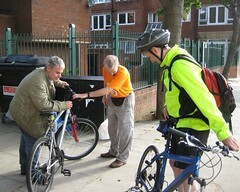 While Dr Bike John and Richard use stands, the more agile Dr Bike James gets down on hands and knees to attend to a superb Dutch bike Richard as Dr Bike John as Dr Bike Dr Bike James obscured by Dutch bike As usual, the maps were popular and people asked for help with routing, so we recommended that they use the Cycle Streets route finder accessible from the Camden Cyclists mapping site. We cleared up soon after 10 am, having to chase away the last few visitors. We signed up several new members to LCC.